Hi everyone! This is GiGi from The Cricut Bug and I have a fun treat to share. I used the Monthly Spotlight stamp set on this project, Springtime Greetings. I started this project with the Scallop Slider and Topper Die and cut it out. I added the sentiment banner cut with the Flag Dies 2 and stamped the sentiment with the Springtime Greetings stamp set. I cut the caterpillar with the SVG Cutting Files Kawaii Bugs file and stamped the face with a Peachy Keen Clownin Around face. I also added a row of grass cut with the Spring Dies and the butterfly cut with the Spring Dies 2. I cut the candy tray using the Candy Caddy Die and and stamped all the candy images from the Kawaii Candies stamp set. To finish, I added the candy tray to a 2.25 X 8 inch Clear Bag and attached the topper. 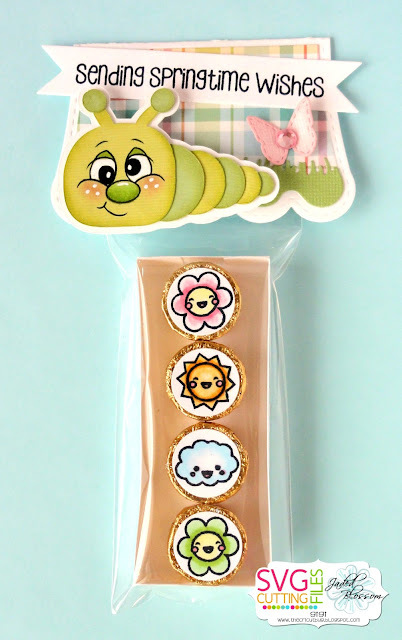 Don't forget, you can get the Springtime Greetings stamp set at a great price this month! So stinken cute Gigi! The caterpillar is so adorable and I love the adorable face! Makes me smile! Really like the sentiments, and the whole thing!